Digital Tape is used to create stunning effects in a host of applications such as clubs and bars, casinos, cruise ship, stage and retail display. 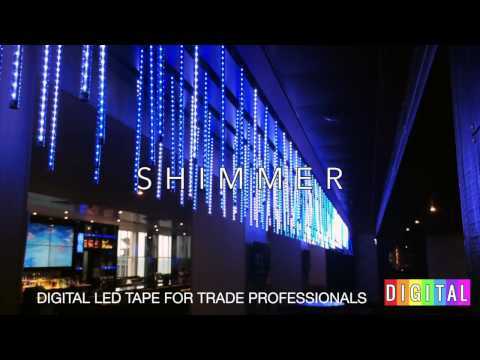 Providing a stunning LED lighting solution, digital tape offers flexible, flowing and colour-changing effects. Increasingly popular for home, office and retail lighting, as well as for entertainment centres, digital tape is straightforward to install. With years of experience in LED lighting, Ventola Projects offer a wide range of digital and standard colour-changing digital tape. Digital tape can be cut directly after each LED along a marked cut line and is capable of working up to 10 meters with no loss in performance or effect so the solution we provide will be tailored specifically to your needs. Installed by our expert team, on every project we aim to supply you with energy efficiency, an excellent service and spectacular, environmentally friendly lighting.